just end up getting forgotten and simply swallowed up by the shear number of apps on the market. Let us help you take advantage of this massive android marketplace and get your App seen by the masses! 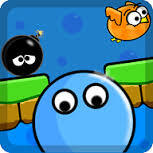 Android-Apps.com alone currently has over 250,000 Android Apps listed in our database and sometimes app’s can get dragged into the pits of the android apps lists. But our featured app package put’s your app front and center and give’s your android app incredible exposure throughout our massive community of android enthusiasts. 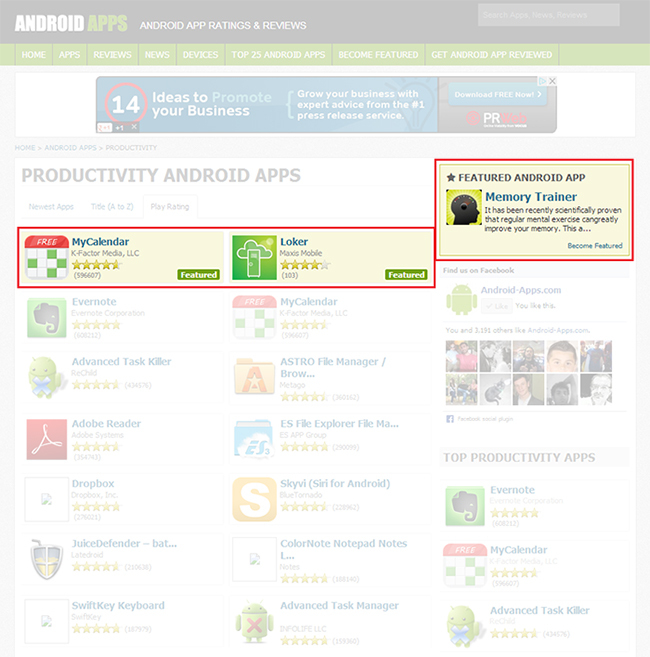 Android-Apps.com gets thousands of pageviews per day and is seen by hundreds of android enthusiasts a month. Becoming a featured android app on Android-Apps.com can increase your app’s exposure, bring more traffic and installs and get your app seen plain and simple! Our featured application packages are designed to get your app out of nomads land and into your users android devices. 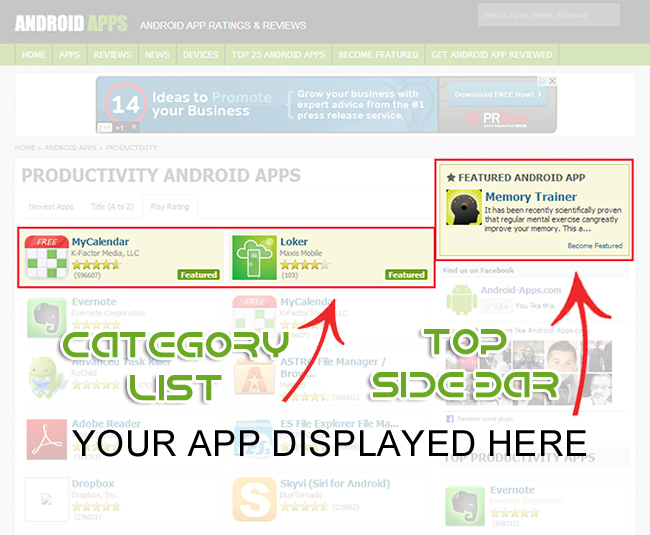 When you sign up to become a featured app, your app will be displayed and highlighted above all other’s in many high traffic area’s of the Android-Apps.com site. Once you become a featured app your application will be shown above all other applications in your apps category list. Whether the list is sorted by date, title, or rating, your app will be at the top of the list… no matter what. We want to give our featured apps top priority of views and attention, and being featured here will do just that. The Featured Android App section in our sidebar is the most viewed spot of the whole site and your app will be shown front and center site wide. This featured android app box shows up on every single page of the website and will drive high amounts of traffic to your apps detail page and install link. Once you become a featured android app, your app will be featured here and will be visible at all times across our entire website. So are you ready to take advantage of all the benefits that our featured app program has to offer? Simply fill out the form below by choosing a package and entering your Google play link and app name. If your app isn’t already in our system, we will add it and you will be emailed once your app goes live (usually 2-3 hours). Your app will be featured for the duration of your chosen package. Once your featured duration is over, we will email you asking if you would like to renew. And that’s it! things really can’t get any easier than that. So go ahead and choose your package below and get ready for a flood of traffic to your app’s! Get ready for instant Traffic and Visibility to your Apps!